The sky is grey and the smell of smoke still hangs in the air. Today was a good day because the monitoring stations at Truckee, Kings Beach, and Tahoe City registered in the "Unhealthy for Sensitive Groups" range. Last Friday the air quality went into the "Very Unhealthy" category. The air quality is predicted in the "Unhealthy for Sensitive Groups" for this Friday, August, 30. This is what the smoke looked like today, 8/29 over Donner Lake. ﻿﻿﻿Ozone is part of the problem during the day, but the particulate matter in the smoke is the hazard that you can't see. The smoke can irritate the eyes and airways, causing coughing, a scratchy throat, irritated sinuses, headaches, stinging eyes or a runny nose. For many people, there are no symptoms, but the long term health effects are unknown. Health officials recommend avoiding heavy exercise when you smell smoke in the air. Two fires are pouring smoke into the Tahoe basin. The American Fire is 98% contained, but the fire is still burning within the containment area. 26,000 acres have been burned. The Rim Fire, near Yosemite is the real problem for Lake Tahoe. 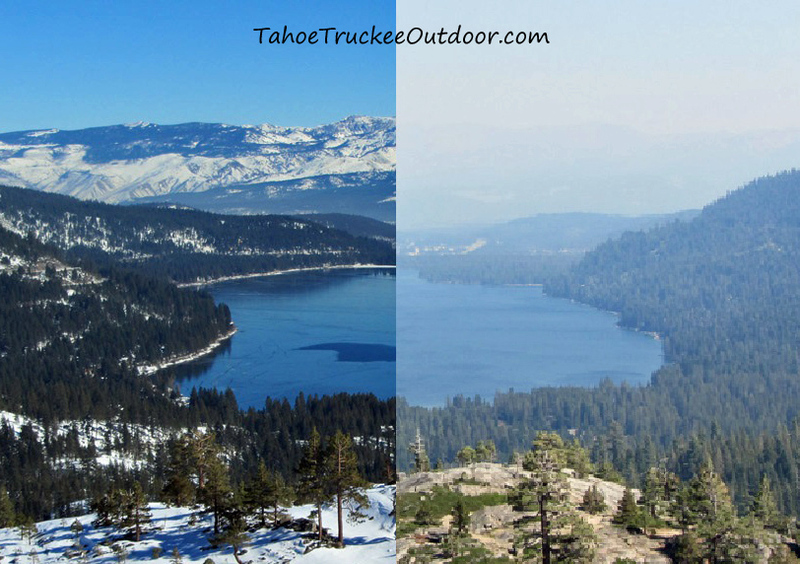 As long as the winds push the smoke north, Lake Tahoe will remain smokey. The Rim Fire is listed as 30% contained. 192,737 acres have burned so far. Check webcams before you visit Lake Tahoe. There are numerous webcams that will show you the smoke conditions before you get here. Check air the air quality forecast and current conditions.